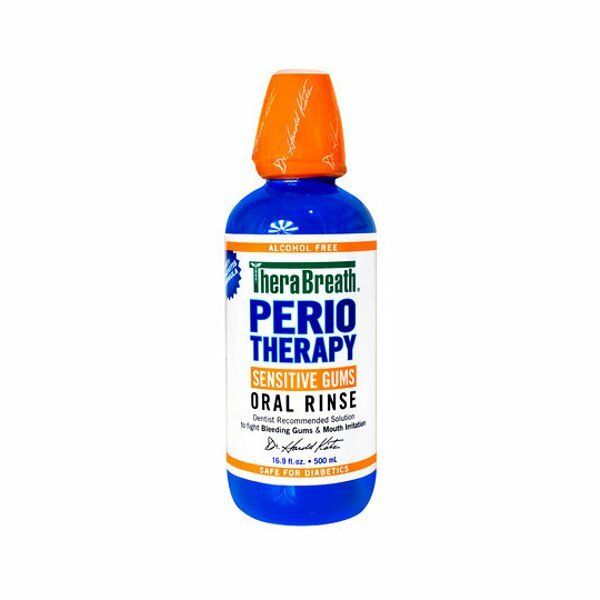 If you suffer with bleeding gums or early onset periodontistis, the use of PerioTherapy oral rinse and Therabreath PLUS Tooth paste will return your gums to health by targeting the bacteria that cause the disease. 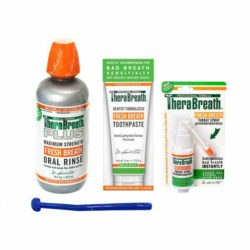 A good oral care regimen must be followed to ensure a complete recovery an. 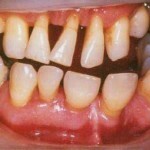 When you commence treatment please ensure that you throw out your toothbrush and start using a new, SOFT toothbrush. Periodontal disease is the result of a buildup of plaque which is the combination of bacteria and debris found in the mouth which forms a sticky clear substance that adheres to the teeth. 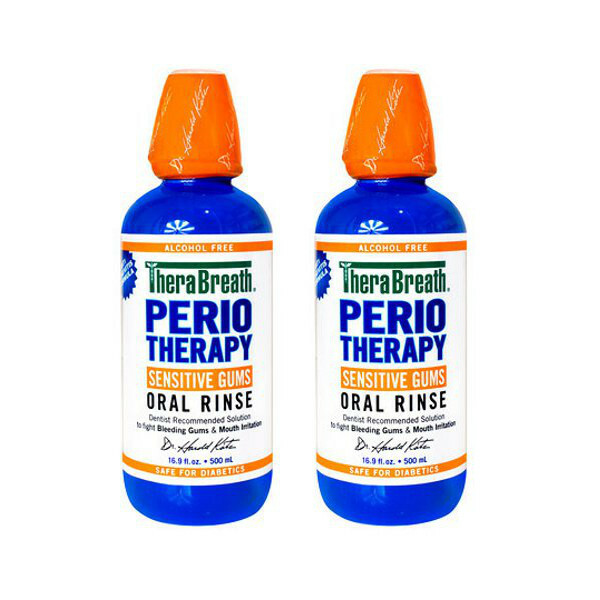 If oral hygiene is not as good as it should be and the plaque is not removed, this results in the hardening of this substance which is now known as tartar. 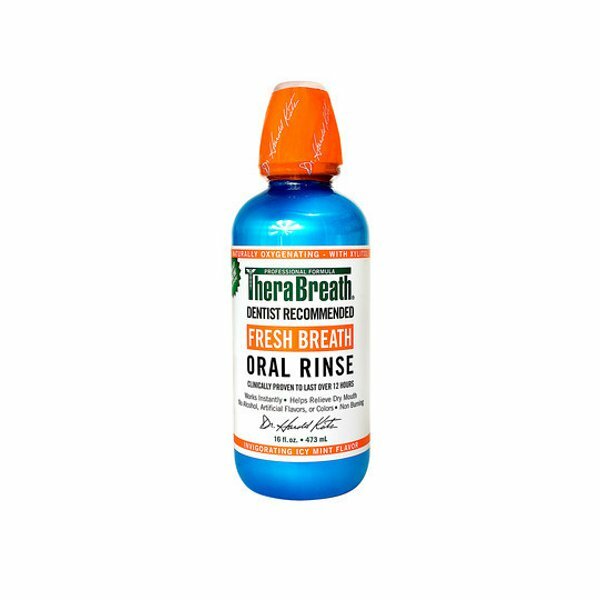 Tartar is hard, cannot be removed through normal brushing and needs to be removed by a dentist or a dental hygienist in a process known as polishing and scaling. 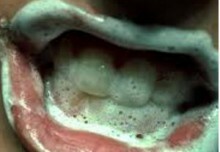 If tartar is not removed, it will result in gingivitis which is the inflammation of the gums resulting in your gums becoming sensitive, swollen and red that will easily bleed. If you experience gingivitis take control straight away, this is the early stage of periodontal disease that can be stopped by a visit to the dentist and a good oral care regimen of brushing, flossing and rinsing. You should return to have your teeth professionally cleaned at least twice a year until there is absolutely no sign of gingivitis. 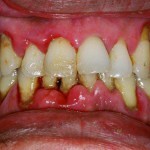 Failure to treat gingivitis will result in periodontitis. 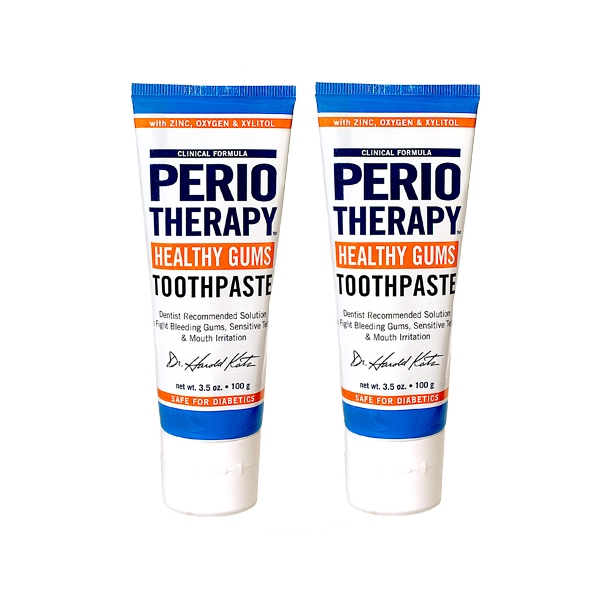 Periodontitis means there is an inflammation around the tooth/teeth, gums begin to recede and leave spaces between the teeth and gums that bacteria find their way into. 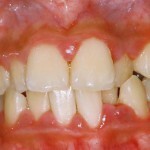 These spaces between the gums and teeth become infected and your immune system kicks in to protect your body by breaking down connective tissue and bone. 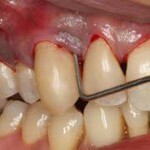 If this stage of disease is not treated the result is the destruction of gums and bone resulting in tooth loss. Below is a gallery of pictures of the various stages of periodontal disease which will assist you in identifying periodontal disease. 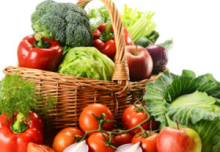 This is by no means a comprehensive gallery of images of periodontal disease and should you suspect that you have any form of periodontal disease, please see you dentist or a dental hygienist as soon as possible. 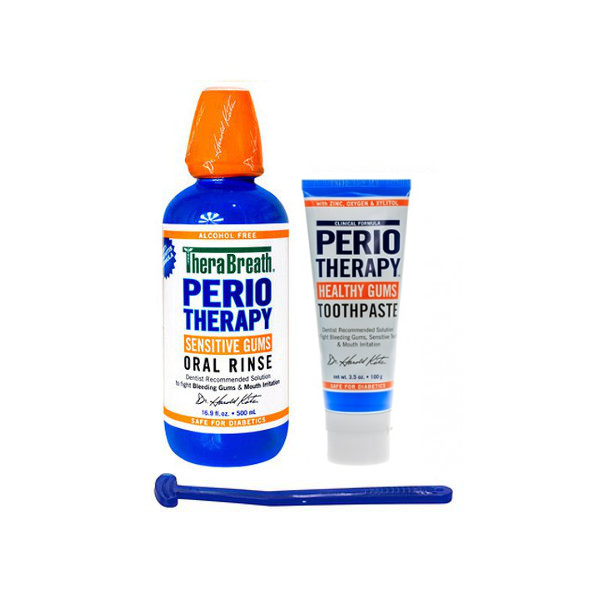 Order your Periotherapy Essentials Pack and free yourself from bleeding gums. 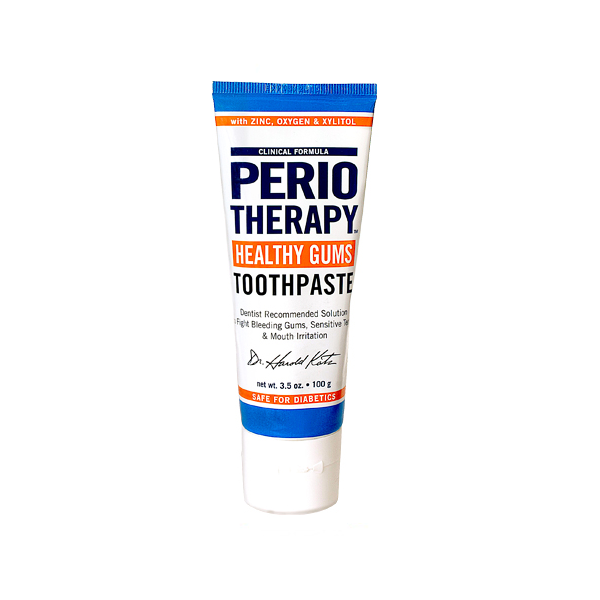 People who have periodontal disease suffer terribly with bad breath, not only as a result of neglected oral hygiene but more as a result of the blood and debris present in the mouth. 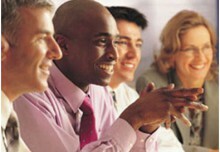 Read more about the causes of bad breath.